This is a Duplex alloy stainless steel designed to feature high strength, resistance to pitting, stress corrosion cracking, erosion corrosion and corrosion fatigue, crevice corrosion and strong weldability. Power industry FGD systems, utility and industrial scrubber systems, absorber towers, ducting, and piping. The high chromium and molybdenum content of Super Duplex makes it extremely resistant to uniform corrosion by organic acids like formic and acetic acid. 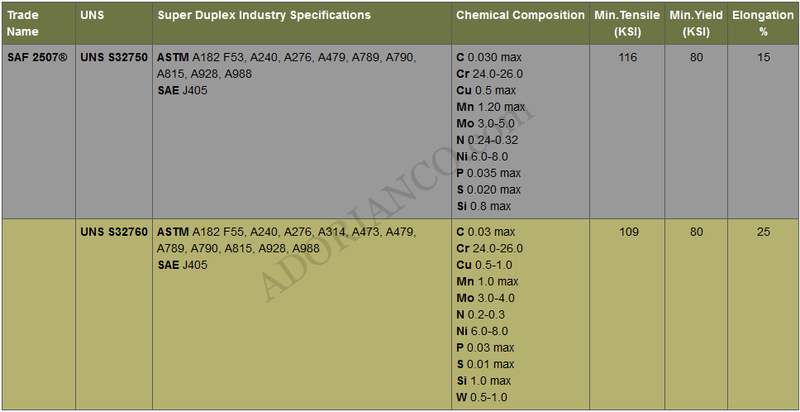 Super Duplex also provides excellent resistance to inorganic acids, especially those containing chlorides. The pitting Resistance equivalent of Super Duplex, calculated by PREN = Cr + 3.3Mo + 16N, will exceed 40 in most material forms.